Does this look like the face of someone who is really done with drugs? 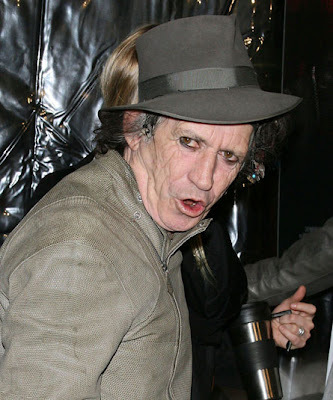 BERLIN — Rolling Stones guitarist Keith Richards has offered troubled singer Amy Winehouse some free advice on kicking the drug habit. "She should get her act together," the former junkie said during a round-table interview at the Berlin International Film Festival on Friday to promote Martin Scorsese's Rolling Stones documentary "Shine a Light." The often-addled rocker paused, then added: "Apart from that, I have got nothing to say to the b****." Winehouse, 24, entered a London rehab clinic last month in hopes of kicking a destructive habit that has overshadowed her promising career. Stones frontman Mick Jagger, himself no stranger to pharmaceutical experimentation and resulting legal troubles, compared the drug problems of the present generation of Brit rock stars, such as Winehouse and Pete Doherty, to his early days when drugs became an integral part of the pop music scene. "When we were experimenting with drugs, little was known about the effects," Jagger said. "In our time there were no rehab centers like today. Anyway, I did not know about them." Sounding a bit like the 64-year-old grandfather that he is, Richards said he couldn't understand how the younger generation, knowing the dangers of drug use, could still be users.